This little gem is the BOMB and it's made with yeast! This is the second recipe I've made out of the Taste Of Home Baking Book 2013! I saw the picture of this, read the recipe and couldn't WAIT to get into the kitchen to make these! I absolutely love making things I've never made before, when I saw that this recipe had yeast it in, it was a done deal. A Danish Crispie has the appearance of a big cookie, but there's so much more to it. It's slightly soft on top, the bottom browns beautifully because of the butter and sugar. There is cinnamon inside and outside yet it's not too sweet. This isn't bread like at all, it has a cookie texture. It would be perfect with coffee or tea. The dough is made, then refrigerated overnight. The next day you roll the dough out into an 18x10 inch rectangle, spread butter on it, ( I used a whole stick of butter 8 TBLS instead of 6 TBLS) top it with sugar and cinnamon, roll up from long side jelly roll style and cut into 3/4 in slices. 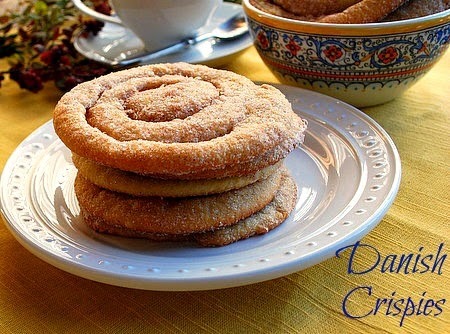 You then put wax paper down and sprinkle the cinnamon and sugar topping down. Lay your slice down and roll with a rolling pin, flipping over and adding more topping as you go until you have a 5 inch circle. Put your circles on greased cookie sheets, I got six circles to a cookie sheet. Top with more topping if you like. Bake for 15 to 20 minutes. Mine were baked more toward the 20 minute mark, they were slightly light brown on top when I took them out. This reminds me of a treat you would get in a bakery or a coffee shop. it's just wonderful! Paul and I loved them! Thank you Taste Of Home for your wonderful Holiday Baking Book 2013! Enjoy! edges to seal. Cut into 3/4-in. slices. wire racks. Yield: about 2 dozen.